Mahesh Prasad ( Technical Architect - LAMP ) [AWS Cloud, IOT, Mobile Apps, Big Data, Analytics, Data Virtualization, Web Services] | I am interested in Full time Job, Part time Job, Remote work, Consulting on web development, Freelance web architect. Erlang, the functional programming language. Here I will explain how to use CouchDB NoSQL database on CodeIgniter using PHP On Couch open source library (Data Access Library to access a CouchDB server with PHP). PHP On Couch tries to provide an easy way to work with your CouchDB documents with PHP. Here I assume you know PHP and CodeIgniter. 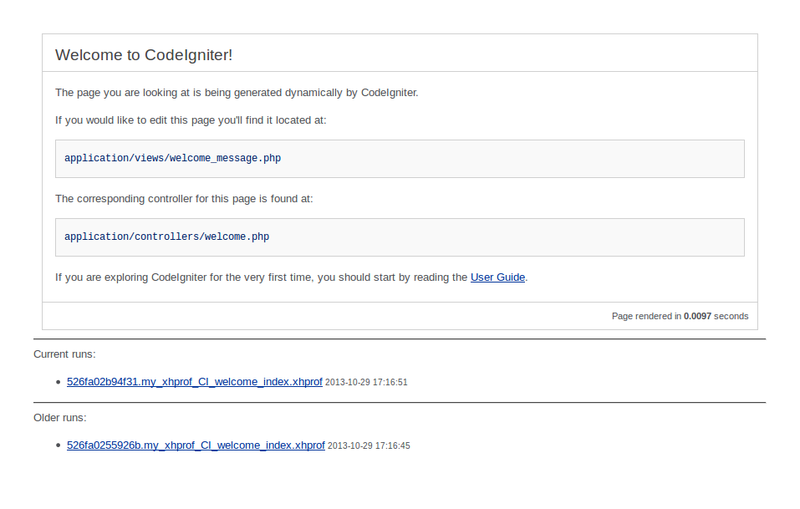 If don’t go through http://ellislab.com/codeigniter Its running on your system. Here is How to use Couchdb NoSQL database on CodeIgniter? XHProf is a function-level hierarchical profiler for PHP and has a simple HTML based user interface. The raw data collection component is implemented in C (as a PHP extension). The reporting/UI layer is all in PHP. It is capable of reporting function-level call counts and inclusive and exclusive wall time, CPU time and memory usage. Installation of XHProf can be done via PECL – as per php manual, it’s very hectic get the PECL version installed on Ubuntu. For me it’s easier to install from source. So here I will explain how to install from source. To install from source we will require “phpize” pecl extension. So first we will install phpize. 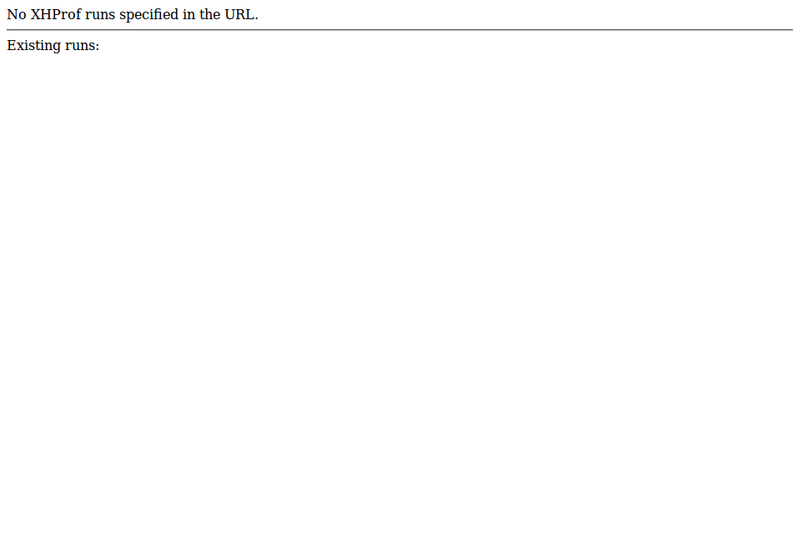 In this topic I am assuming a PHP web server running with (Apacpe and PHP). Step 1.) How to install phpize on ubuntu? On Debian/Ubuntu, it’s in the php5-dev package, so we will install php dev package. It will be available here: /usr/bin/phpize instead of only phpize. The php5-dev package contains various files absolutely essential to compiling PHP. Since it’s a shell script, you can just copy it from the package, but it won’t work without the dependencies for building a PHP extensions (like header files). In the C world, compiling dynamically linked libraries (DLL/SO) is done by using header files that contain the description on how the libraries are to be interacted with (function calls, structures, etc). These are used to compile an extension without the need for the PHP source code itself. In other words, you don’t need the PHP source but you actually need the header files which are contained in php5-dev. To connect to github.com insecurely, use `–no-check-certificate’. Extract the tarball and switch into the extracted folder – this will change depending on the latest revision available from GitHub. You can directly download and extract it. Now copy xhprof source to web dir (doc root folder) for viewing the logs and make dog dir inside it. 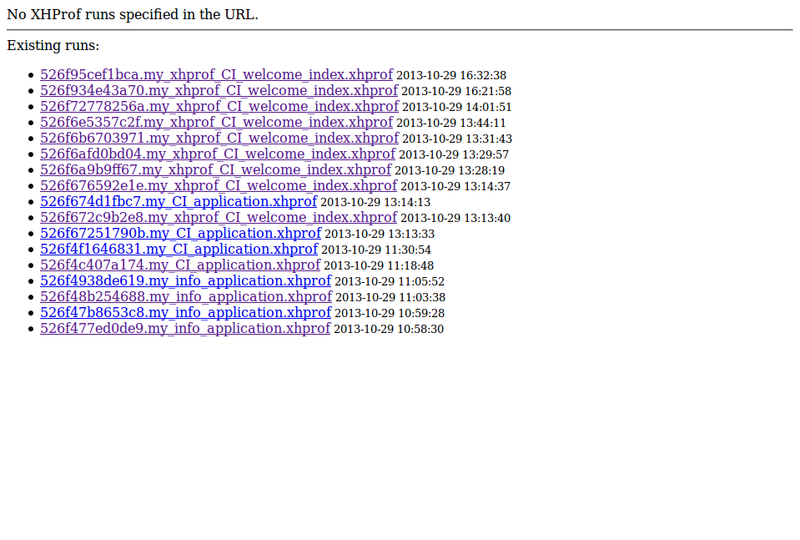 Note: path of xhproff log dir must be php execute user accessible. Means it must be in /var/www/ dir or accessible to www-dada user as this www-data user execute php script and xhprof log are created by this www-data user. This tells XHProf to use the directory at /var/www/xhprof/log_data to save its run data. This already explained in 2nd setup, but again I will explain it. Copy xhprof source to web dir (doc root folder) for viewing the logs and make log dir inside it or inside doc root to make www-data user accessible and also set writable permission to www-data user. This has been done in 2nd step so it must not be done again. CodeIgniter has an excellent mechanism for injecting custom code into the execution of a page called ‘Hooks’. This is what we’ll use to integrate XHProf with your application. Enable hooks in your application/config/config.php file. Then create the hook that will load XHProf into your application at application/hooks/xhprof.php. This class will provide the necessary minimum to get XHProf collecting data from your application.
. htmlentities(basename($file)) . "</a><small> "
• The $XHProfPath variable should point to the directory you installed XHProf in as explained in step 2 and also above in this step. In our example, we put it in the root of the web application, but you might be storing it somewhere central and symlinking it to multiple applications. • The $applicationName variable lets you specify the name of the application using XHProf. This could be especially important in an environment where you’re running multiple applications on the same server. 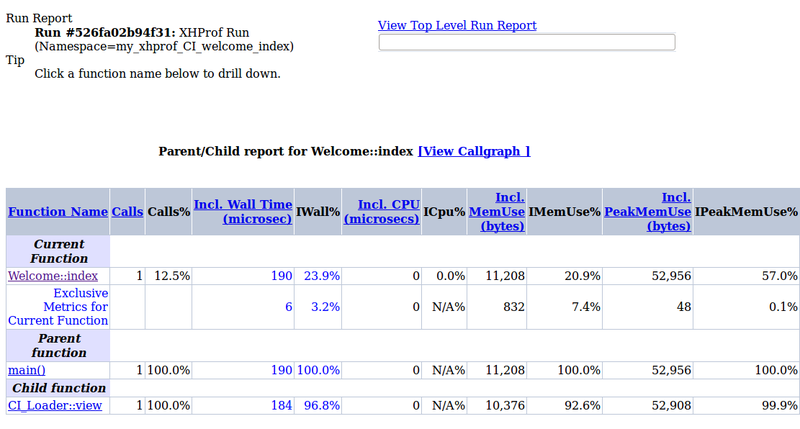 • The $sampleSize variable lets you specify a factor for how often XHProf profiles a run. In a production environment where you’re receiving thousands of hits, it’s probably not worth storing every single run. 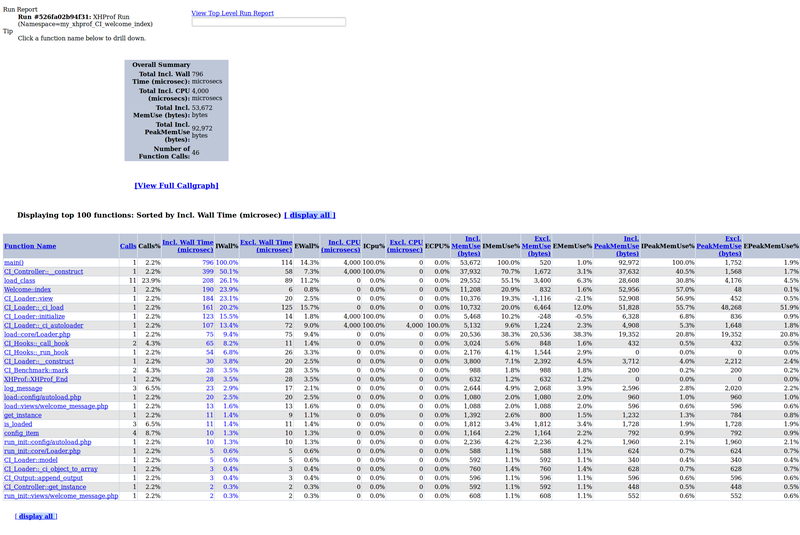 You can increase this variable to get a random sample of runs. Changing it to 10, for example, will give you a report from one in every 10 visits to your application. After running through your application a couple of times, point your browser at the XHProf application directory http://localhost/xhprof/xhprof_html/index.php – adjusting for the address of your development server – and you’ll see a list of your last application runs with the newest at the top. Select one of the runs to see its profiling information. Storing all this profiling information is all very well and good but knowing how to evaluate it is the key to optimizing your application. 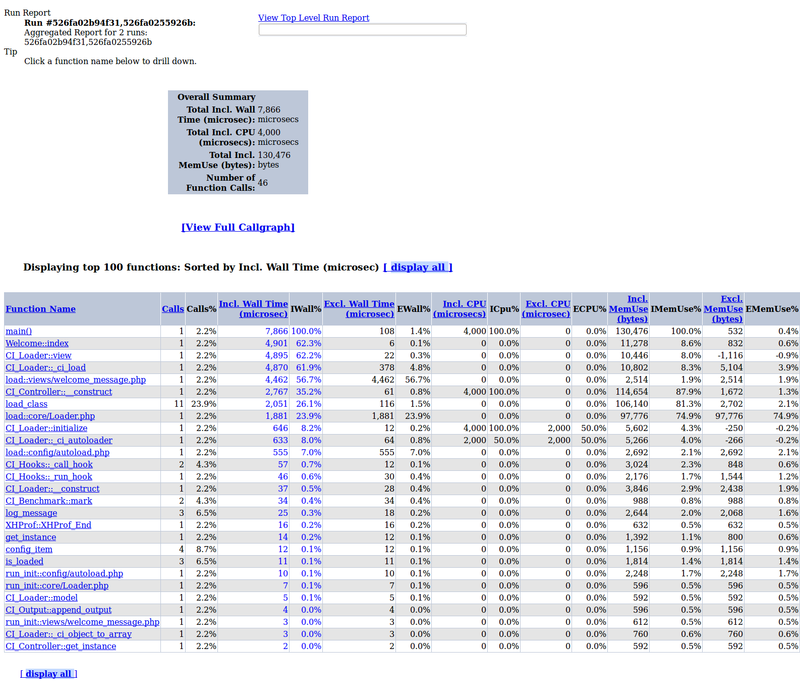 These numbers should give you an overall base to start from and provide headline numbers to compare against when you start optimization. When debugging your CodeIgniter application, one of the best places to start is the controller being called for your page – Welcome::index in the example. From there you can easily see the breakdown of where the controller spent most of its time. 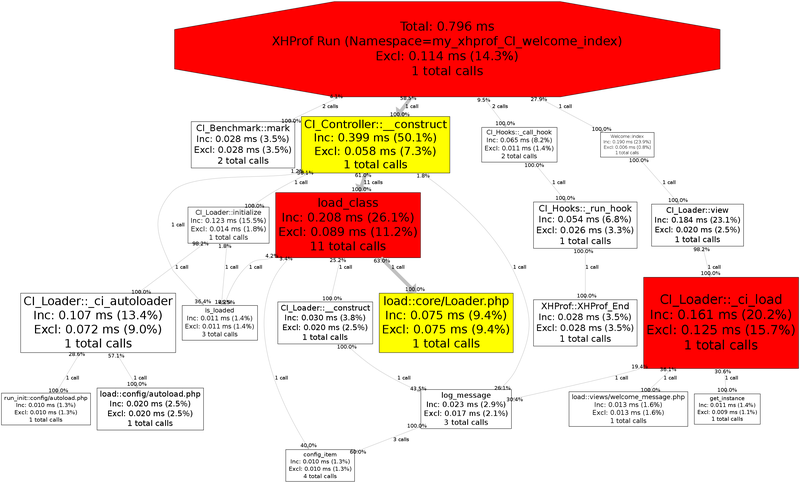 XHProf provides a mechanism for comparing multiple runs – this will allow you to make a number of optimizations and then see how they’ve affected your application. Note: run_id_1 and run_id_2 should be the ids from some of your previous runs and applicationName should be the name you specified when setting up the hook earlier. 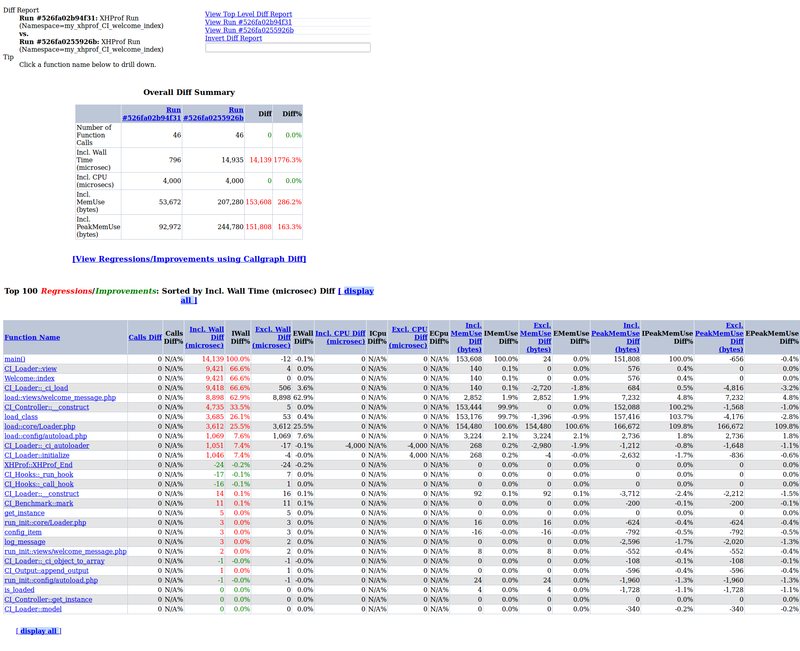 This will provide the same information you see in a regular report but provide percentage statistics on any changes since the first run, allowing you to easily see if your optimizations are moving your performance in the right direction. Note: run_id should be the ids from some of your previous runs and applicationName should be the name you specified when setting up the hook earlier.